Resource prices have moved to the center of attention during the last couple of years. With oil spot market prices peaking in July 2008 near 150 US$ per barrel, their subsequent decline to 30$ a barrel and their rise towards a 100-120 $ price band in recent months have ensured that oil and its cost receive a lot of attention. Most people we talk to about the future of energy ask us what we think the future of oil prices will look like. A majority of people expects them to rise continuously, as oil gets scarcer and maybe moves beyond peak production. Unfortunately, it's not that simple. The pricing mechanisms for oil (and other natural resources) follow the logic of supply and demand, but equally one additional rule that isn't usually accounted for - which drives volatility. What do we actually pay for? A few brief thoughts about what actually is included in oil (and other resources') prices seems important. Like every other species, we humans do not pay for the total effort required to "produce" the natural resources we use, we only pay for their extraction. Equally, we do not account for the "better uses of nature" we prevent by means of our own consumption, nor what damage we cause with our actions. Let's use a simple example: if a deer eats so much from a small tree that the tree subsequently dies, the only thing the deer "accounts" for is the energy it takes to get to the tree, to bite, to chew and to digest the energy content in the branches and leaves it consumed. The energy and time it took for the seed to grow to the size it had before it became food do not matter to that deer. And similarly, in general, we humans don't pay for the "externalities" of our consumption, neither for the effort that went into the creation of the resources we use, nor for the damage we leave behind, nor for the future problems that might come from the fact that the resources are gone. There are a few exceptions to that rule, imposed by humans that care for the rest of our ecosystem, but this is and always will be a small portion of the "true cost", particularly once we are in "urgent need" of something. So what we pay, with the price for energy or other natural resources, is the effort to get to the resources, to extract them, to convert them into something useful, and to get rid of the waste in the least costly way possible that avoids direct damage to the directly visible space we inhabit. That may sound a little cynical, but it is - largely - the reality of each ecosystem, not just the human one. In many areas of goods productions, increasing demand has usually made things cheaper. TVs are much cheaper today than ever before relative to our incomes, and so are toys, clothes, and many other goods. For a long time, this equally applied to food, energy and raw materials. However, for this group, the trend has reversed: during the past years, their prices have gone up significantly and - despite the crisis in 2008 - haven't returned to their pre-2005 levels. So what is the difference between what we experience with TV sets and what is happening to oil? 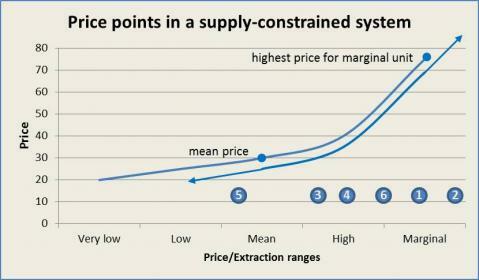 The sequence for price curves is always the same. When a product gets invented (or a resource first used), production processes are geared at "making things work", and not at cost or efficiency. As soon as demand grows, production processes will scale up and become more efficient, reducing the cost per unit of output. Then, production will move to the place where energy, labor and transportation cost create the most favorable cost mix. As long as inputs aren't quantity- or price-constrained, prices in this second phase asymptotically approach a relatively stable low level, as soon as demand and supply are somewhat aligned. Figure 1 - marginal cost of production/extractionFor finite resources, however, this does not apply. At one point, when we have exhausted the best finds and have to resort to sources of lower quality, higher extraction difficulty, or longer distance from the place of use, this cost curve begins to irreversibly point upwards. For oil, this is quite obvious - extracting crude from a sandy desert is clearly less cumbersome and cost-intensive when compared to deep-water drilling. The same is true for other commodities: once ore grades are only half of what they used to be 20 or 30 years ago, no technology advance can offset the much higher effort required to move twice as much rock around to extract the same amount of material content. And this in aggregate inevitably happens to every resource we use - as our extraction efforts become more complex over time. Figure 2 -Price dynamics in constrained systemsWhile complexity increases, even if no absolute "peak" is in sight, market prices of this good grow along the price curve of extracting the latest, most expensive (marginal) unit, i.e. the one that is most complex and difficult to get to. This creates a very nice windfall profit for those suppliers that still produce below that maximum price - one of the reasons why many oil companies and exporting countries have done so well in the past five years. As long as this trend continues, market prices in relatively open and transparent markets will always linger around the cost of the most expensive resource. Currently, oil - with a price range between 70 and 90 dollars is exactly in that spot of "highest marginal price" (see price point one in Figure 2). The reason why this happens has to do with the tendency of markets to maintain an equilibrium between supply and demand. As soon as this is disturbed, prices will shift - often drastically - as we saw in 2007, 2008 and 2009, and now 2011. In late 2007 and 2008 and in recent months, we saw a slight overshoot of demand (or perceived shortages by markets leading to speculative buying) for many resources, including oil. With a little bit of additional speculation, this led to oil prices of almost $150 (point 2 in Figure 2) in 2008 and $120 in 2011. This mechanism was more or less a product of well known rules of supply and demand - if demand is larger than supply, prices go up. For important commodities that are essential to human economic systems like oil, price elasticity of demand (i.e. demand reduction based on a good becoming too expensive) is initially low because things have to keep going. That way, significant price increases are possible within a short period of time. However, as soon as prices hit a level that isn't sustainable in the long run, like in mid 2008, - and we're afraid that also will be the case soon again - demand has to drop, as more and more marginal uses become uneconomic (like transportation for certain things). At that point, when demand begins to fall back below supply, prices quickly retreat to the price of the "marginal unit sold" (points 3 and 4 in Figure 2). This means that the highest marginal prices will no longer be paid by markets. Often, it is likely that markets overshoot in the other direction and that prices end up at the point of average (or median) extraction cost, which is what happened in late 2008 and early 2009, when oil went down to around 30$/barrel (point 5). Once this price readjustment after demand reduction happens, investments and extraction for the most expensive (marginal) units will cease or drop, which reduces total supply. At the same time, demand will likely pick up because of now lower and more attractive prices, thus shifting the paid price back up to a higher point (point 6). While this happens, more extraction becomes attractive once again, so supply will keep track with demand, at least for a while, pushing the price slowly up to its previous equilibrium price (point 1) or beyond, should demand rise too fast. This mechanism will keep going for quite a while, as long as the essentials - supply and demand - remain largely unchanged. However, there are a few side effects that affect this system over time. First of all, once the supply side has become aware of the risk of quickly falling prices, investments into marginal extraction technologies will become less attractive, which might drive markets into a supply-demand imbalance more often. At the same time, many uses for a certain commodity become more problematic with heavily shifting prices, as production environments become less and less predictable. This might lead to substitution away from a particular commodity, and to lower demand. As long as we are talking about essential commodities though, this will be very difficult. But ultimately, a rocky ride on resource prices is almost guaranteed. by Arthur Williams on Fri, Oct 28, 2011 - 06:12 (EST). Thanks for this article and the explanation of price volatility. Does the long lead time between discovery and production also contribute to this? When prices increase in the short term, supply is still limited - but then in the longer term, new supply comes on stream at a point when prices are already falling. How much of a factor do you think this is? by Hannes Kunz on Fri, Nov 18, 2011 - 02:45 (EST). definitely add to the volatility in price, as (perceived or real) shortages last for much longer than they would in a more flexible production environment. Equally, if new output hits a downturn - which is what largely happened with a lot of the new natural gas capacity in the United States in 2008/9, the new capacity which needs to keep producing despite not covering full cost - due to asset depreciation and time limits on leases - can add to the extension of periods at lower prices.